2 and 3 BR oceanfront homes - affordable luxury ! 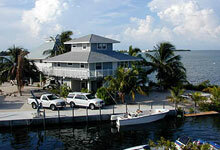 We offer oceanfront homes on a canal for dockage, oceanview homes with canal and sunset view homes. 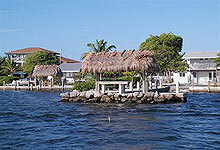 All have tiki huts, modern furnishings, canoes, complete kitchen equipment and linens. We offer kayaks, canoes, rowboats, bicycles and a barbecue grill at each home. Low monthly rates, see beautiful pictures on our website. Sun-drenched tropical luxury awaits you at the southernmost KOA, just 20 miles from Key West. Relax on our private sandy beach or rent a boat from the marina. 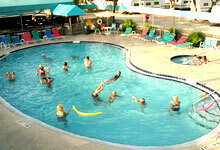 Enjoy the freshwater pool, hot tub, mini-golf and water-front pub/grill. New RV efficiency rentals available. Great snorkeling, diving and fishing. 50 AMP Service Available. All of our accommodations have a water view! 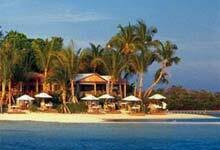 The Island Little Palm Island Resort and Spa is a private luxury resort with only 30 one-bedroom suites. All of our accommodations surround the perimeter of the island and have a water view. Our Island has something to please each and every guest, including, our natural white sand beach, fresh water lagoon style swimming pool, fitness center, Great Room library and game room, indulgent SpaTerre, full-service dive shop with daily excursions, an endless array of water-craft choices and gourmet cuisine. We welcome children 16 years and older. Relax on our waterfront, watching fishermen come in with their catch. Enjoy our tropical gardens, swaying palm trees, and stroll through the aviary, home to dozens of tropical birds. Fish the nearby flats for tarpon or fish offshore in bluewater for sailfish, marlin and dolphin.